Today Mummy, Lots and Pudge took me to a beach. I am not sure I have really been on a beach before.. not sitting down myself anyway. 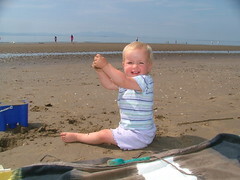 Mum put me on the sand and I picked up lots of handfuls and filled a bucket. I did this for about an hour. It was great fun. Then I suddenly realized Lots and Pudge were running around. Maybe you can walk on sand!? I got up and tried and it worked! It was amazing. I spent the next 90 minutes running up and down and round in circles with my bucket getting my toes all sandy and I even found a huge big bath I could walk in at the edge of the beach. Mummy says it is called the sea. Mummy says the beach is just the nicest place in the world and I think she might be right. I think I want to go to the beach tomorrow and show it to Daddy too.